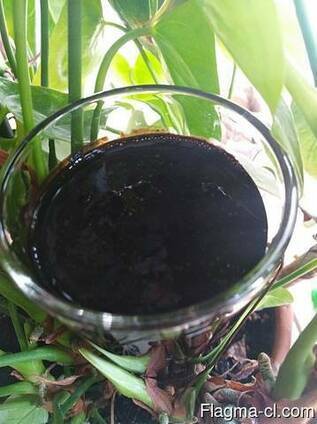 Fertilizer potassium humate " FK " (liquid concentrate) from environmentally friendly lowland peat, which does not contain heavy metals. Fertilizer is made according to TU BY 291502328.001-2018. The composition of the fertilizer includes humic substances (humic + fulvic acids in a concentration of 80 - 120 g/l) humic acids - not less than 17 g/l, fulvic acids - not less than 60 g/l, potassium-13 g/l, as well as nitrogen, phosphorus and many other useful micro and macro elements. Due to the presence of high concentrations of fulvic acid in the fertilizer, which breaks down minerals in the soil and facilitates their easy assimilation by the plant, the guaranteed yield increase on humus-poor soils is 15-40%, while a decrease in the accumulation of pesticides in the fruits of plants is observed. The use of this fertilizer increases drought and frost resistance of plants, stimulates plant growth and root system. It is used for seed germination, root and foliar processing of a wide range of crops in all climatic zones. Consumption of the drug in the treatment of seeds of -0.3 l/t of seeds, foliar treatment of 0.5 l/ha. solubility in water 100%. The drug is non-toxic, fire and explosion safe (hazard class 4). Different delivery options are possible.